The mother woke the children and evacuated them to the home’s bomb shelter just seconds before the medium-range grad rocket smashed the house deep inside Israeli territory. 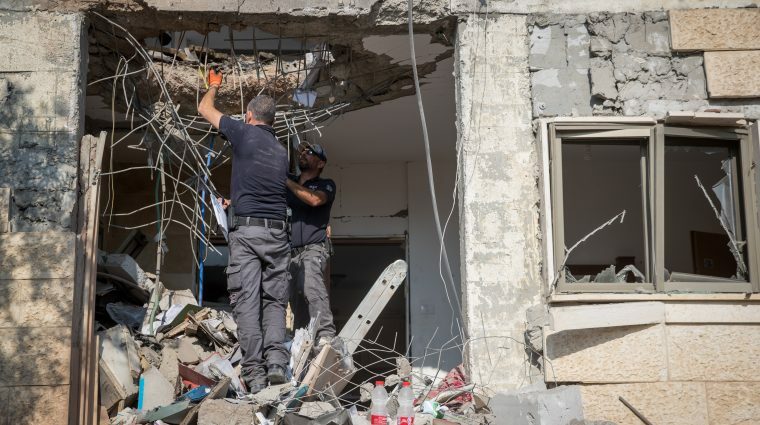 (October 17, 2018 / JNS) A medium-range grad rocket fired by Hamas destroyed a home in Be’ersheva, Israel’s third largest city, deep inside Israeli territory. The Red Alert warning system was activated at 3:39am in Be’ersheva and the surrounding Negev communities, with residents throughout the area scrambling for shelter. A 39-year-old mother and her three children ages 9, 10, and 12 were treated for shock after the rocket scored a direct hit on their family home. After hearing the warning siren, the mother woke the children and evacuated them to the home’s bomb shelter just seconds before the rocket smashed the house. The family was extracted by police and firefighters were called to the scene, where they started to disconnect power sources and neutralize other risks. An additional rocket with an even higher payload was reported to have landed just off the Mediterranean coast, near a major population center. At around 8:30a.m., the Red Alert system sounded in two communities in the Hof Ashkelon Regional Council on the Mediterranean coast. No additional injuries or damage were reported. Israeli Air Force fighter jets smashed 20 Hamas and Islamic Jihad terror targets in response, including underground and undersea terror tunnels, rocket manufacturing sites, and Hamas military bases. The IDF also fired on a terror cell which was in the process of launching additional rockets at Israel. Three Gazans were reported wounded. IDF Spokesman Brig. Gen. Manelis said the retaliatory attacks will continue. He noted that the Iron Done missile-defense system failed to stop the medium-range rocket in this case. The Be’ersheva municipality and the Sdot Negev Regional Council ordered schools closed for the day. An Egyptian delegation arrived in Gaza on Tuesday to attempt to negotiate a ceasefire between Hamas and Israel, with Egypt’s head of intelligence expected in Israel on Thursday. Following the attack, a Security Cabinet meeting on the topic of the ceasefire was postponed. Hamas and Islamic Jihad released a joint statement saying they “oppose rocket fire that hurts the efforts to lift the siege,” but did not deny taking part in Wednesday’s launch. In the wake of the attack, IDF Chief of Staff Gadi Eisenkot cut short a trip to the United States and Defense Minister Avigdor Lieberman ordered the closure of the Kerem Shalom and Erez border crossings, and shortened Gaza’s fishing zone to three nautical miles.